That Saturday, Sunday, and Monday in Puyallup weren’t just dreams. It’s real. We did it! Cooper has his Rally Advanced (RA) title now. 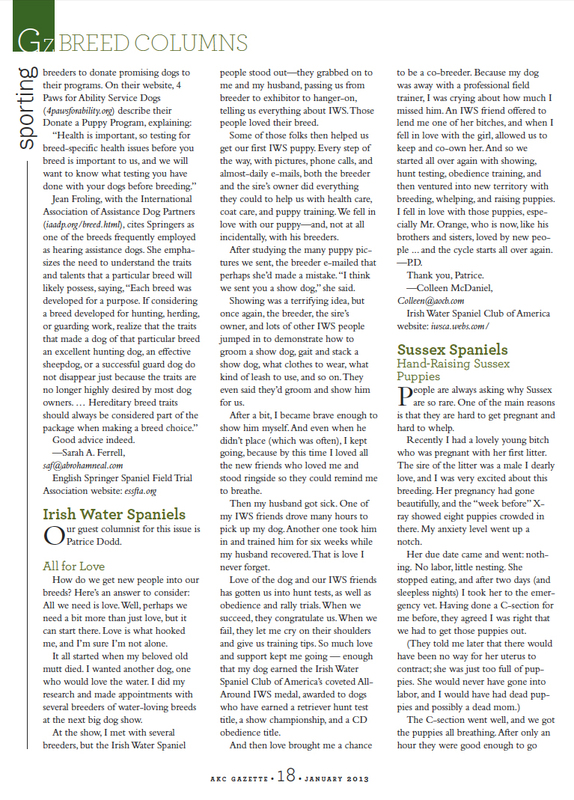 As of today, the AKC says so. Also, I just received in the mail a picture to prove it. An extravagance, given my employment situation. But a very happy one. Hey Cooper, do you want to go duck hunting? Russ: Hey, Cooper! Do you want to go duck hunting today? Cooper: Do I get to wear camo just like you? Russ: Sure, but keep in mind it is going to be cold and wet. Cooper: I’m an Irish Water Spaniel. I can do cold and wet. Russ: Point taken. OK then. 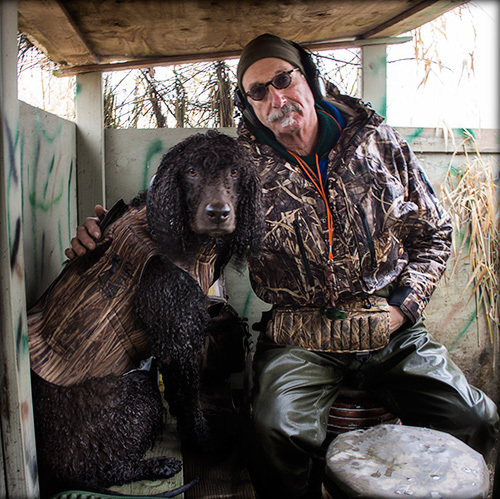 Cooper: Can I put my wet muddy feet on the furniture in the duck blind? Russ: Sure. So does this mean you want to go? Cooper: Is the bear Catholic? Yeah, I wanna go! Cooper being Cooper, I entered him in Rally Advanced in today’s Rose City Classic dog show in Portland. 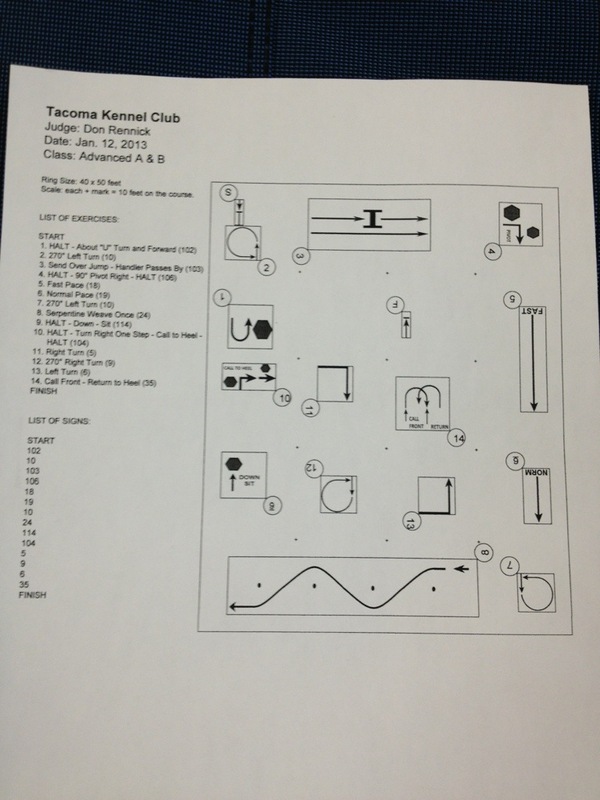 When I was considering in December which shows I was going to enter him in, I figured that there was every likelihood that Cooper would not qualify in least one of the three Rally trials at the Western Washington Cluster of dog shows in Puyallup. And a dog needs three qualifying runs to earn a Rally title. So, for a back-up, I decided to enter him in Rally Advanced in one Rose City Classic show. I picked today, Thursday, because Thursday is the least crowded, least trafficked of the 4 days of shows. The Obedience and Rally rings are right next to all the vendors, where show people come to buy dog shampoos, try out new scissors or other grooming tools, find that special toy, or try samples of various dog foods. The general public comes, too. And all of them, many of them with dogs, travel the walkway between the vendors and the Obedience and Rally rings. Lots of traffic and lots of dogs mean lots of distractions for Mr. Distractible Cooper. Thursday has the fewest people, which means the least traffic, which means fewer distractions. But that doesn’t mean no distractions. Nope, not at all. To see why, look at the arrangement of the four rings. In the picture below, and you’ll see that all four rings are set up in a large square. That means that while one dog is competing in Rally in one ring, other dogs would be in the other three rings, competing in various levels of Obedience right next to him. 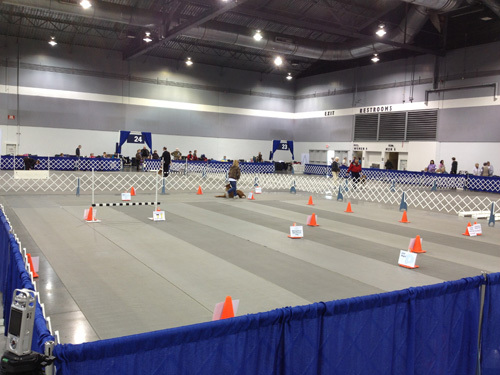 They would be retrieving dumbbells that have just flown through the air, jumping over jumps, running out away from their handlers and toward the opposite end of their ring, which just happens to be just over the white barrier from where the Rally dog is trying to work. So Rose City is tough. 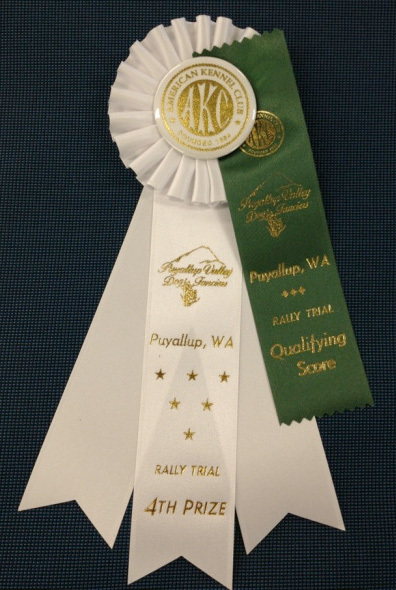 And we didn’t really need to go to Rose City because Cooper passed Rally Advanced trials on Saturday, Sunday, and Monday in Puyallup. He’d earned his Rally Advanced title. But, what the heck — I’d paid for it already, so I might as well go. Fortunately, the AKC allows “transfers.” That means I could bump Cooper up from Rally Advanced to Rally Excellent instead. So that’s what we did. 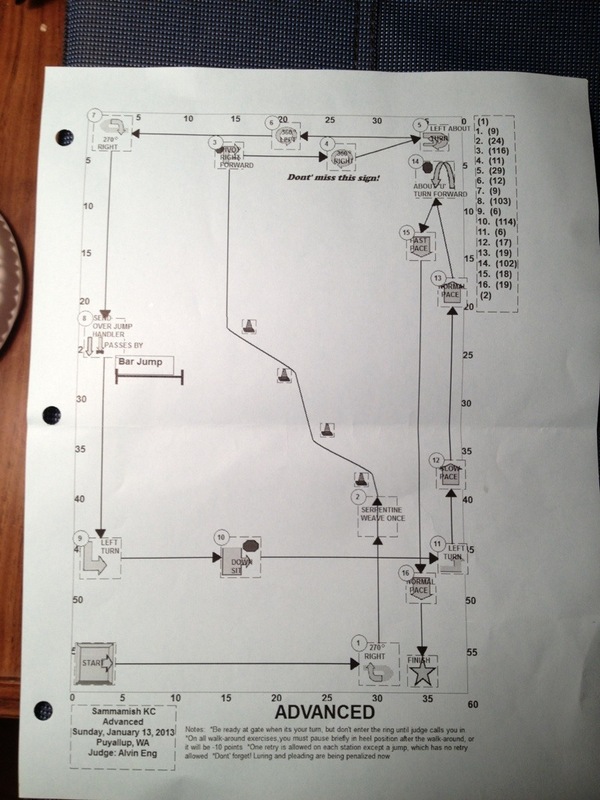 Here’s a map of the Excellent course we ran today. It was not easy. I was very happy that it didn’t include a Figure 8 with distractions, a jump using a broad jump, or walking backwards for 3 steps while the dog stays in heel position, but it still had its challenges. The first was station #2. That station was just three feet away from the entrance — which is also the exit. Cooper had to turn toward the exit to turn around me, and he noticed the exit. I could see that he was thinking about simply leaving the ring. I called his attention back, though, and we went on. Then there was station 5. In that one, Cooper was supposed to lie down while I keep moving. On our first try, he got very distracted by the dog running toward him in the adjacent ring and didn’t lie down. I took a few steps back, called him to me, and we tried it again. This time, he lay down very s-l-o-w-l-y, and he did so facing the adjacent ring instead of the the direction of travel. But he was down, so I walked around him, and we continued on. We did well, including his usual favorite, the jump, until we got to station 12. This is a moving stand, and he’d never done one of those successfully until once last night in our living room. In a moving stand, he’s supposed to stop moving forward and stay in the standing position while I keep moving. He sat instead of staying in the stand position, so we went back to try that again, too. He got it on the 2nd try. But then, in station 13, he was supposed to make the jump again, this time in the opposite direction from before. That completely confused him. I gave him the command to jump and he trotted right up to it, and then just stood there looking around. I asked him three times to jump, and finally he levitated himself over it cleanly. After finishing the other stations and passing the Finish sign, we had one more exercise. At station 17, he’s supposed to sit and stay there until I go get his leash from across the ring, return to him, and then clip his leash to his collar when the judge says “exercise finished.” We’ve done this one so many times just perfectly that I let down my guard and didn’t notice when he started to get up. Consequently, he got all the way up and walked several steps toward me before I got back to him. I took him back to the station, got into heel position, and waited for the judge before clipping on Cooper’s leash and walking out of the ring. The rules say there is no retry on the Sit-Stay, so I’m pretty sure the judge took off the maximum number of points for Cooper’s getting up. Fortunately, I avoided some common handler errors. At the Excellent level, the handler is not supposed to pat their leg, clap their hands, or lure the dog with an “air cookie,” and I managed to not to do any of those. And I think I made some good choices about which stations to retry and which ones to just accept and keep going. 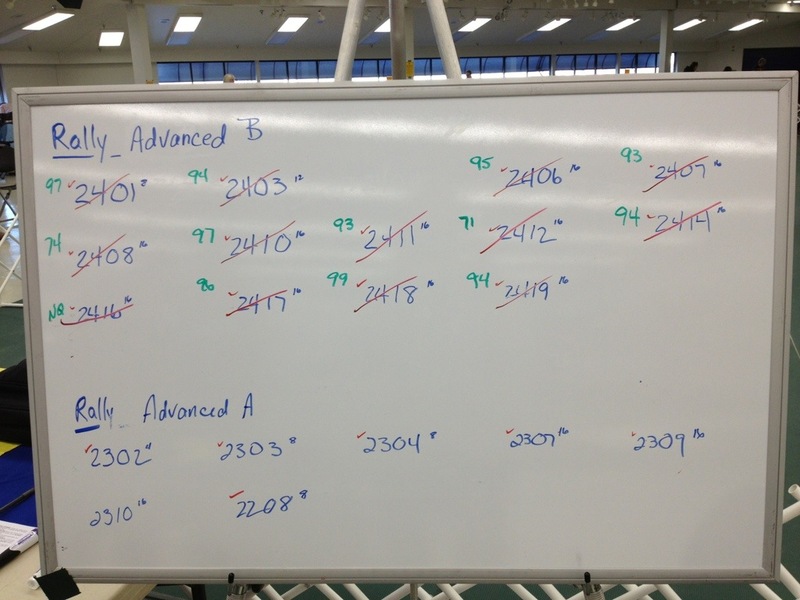 So even with all the mistakes, do-overs, and lack of precision, Cooper still qualified. 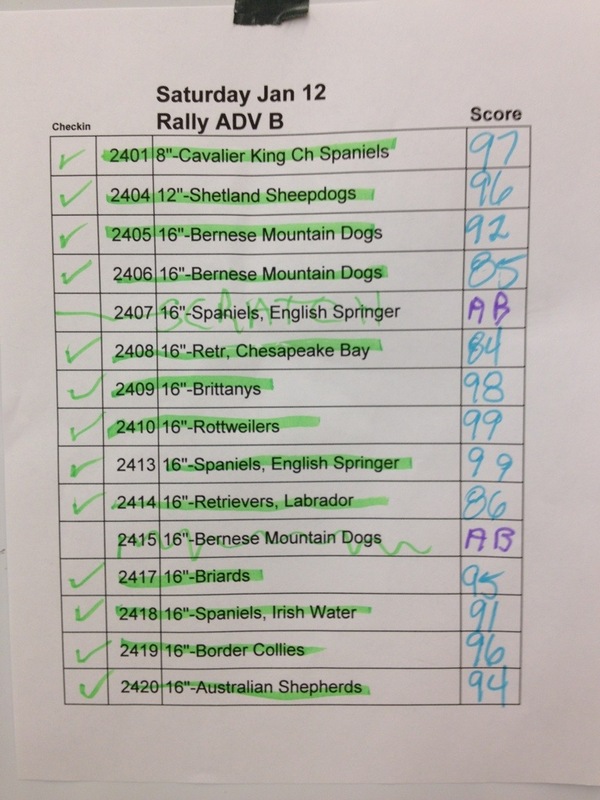 Irish Water Spaniel #R53 got the lowest score in Rally Excellent B, but anything over 70 qualifies. I took the ribbon and smiled all the way home. We have some work to do before we go into the Rally Excellent ring again, but it’ll be fun. Except tonight, I think I’ll give him a break from Rally class. He can stay home with Russ, eat some dinner, and play with his favorite rubber duck. He’s earned it. I write a lot. This blog for example. Emails, notes, greeting cards, lists. All kinds of things. Lately, resumes and a lot of cover letters. A journal sometimes, though not as often as I think I should. I think better when I’m writing — I guess it’s a good thing I enjoy it. But what’s really fun is writing something that gets published and that, unlike this blog, I didn’t publish myself. I guess it’s a vanity thing, but it’s very gratifying to see that someone else has put something I wrote out there in the world. I didn’t use any names because, for the purposes of the article, the names didn’t matter at all. Anyone can give love, and it’s the love that matters. It’s the caring and the support that was given to me that matters, and that I try to pass on to others. Even so, the specific people are very important to me. And I hope I have told you so, often enough that you know who you are, whether you read this blog or the AKC Gazette or not. We did it! 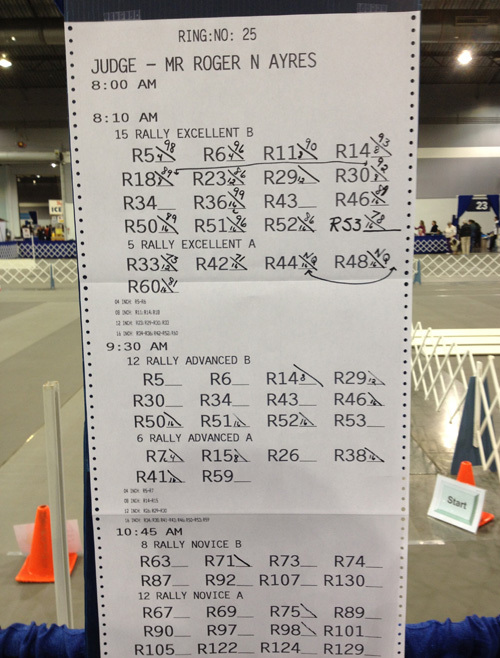 Team Cooper, with this third qualifying score in Rally Advanced, earned Coop’s Rally Advanced title. Now, instead of the Rally Novice (“RN”) title he’s got after his name, he’ll have that very sweet “RA” instead. We had a good time. There was the always-fun jump at station 11 and the finish right at station 5. (For some reason known only to Cooper, he likes finishing right much more than finishing left.) Plus there’s that nice little dance-like move at station 9. But it was also a bit more difficult for Team Cooper. The pivot at station 6 and turn at station 1 require some precision from both dog and handler. Precision is not Cooper’s strong suit (he goes more for exuberant enthusiasm), but today we did well enough. The only real hiccup was station 7, where we were to do the Call Front — 1, 2, 3 Steps Backward. In this one, the dog moves from heel position to around in front, squarely facing the handler, and then, when the handler takes first one, then two, and then three steps backwards, the dog is supposed to follow, all the time squarely facing the handler, sitting each time the handler stops. Coop does that part just fine. What almost caught us up today was that at the very end of that exercise, the handler moves forward and the dog is supposed to move smoothly out of the front position and into heel position without interfering with the handler’s forward motion. But Coop didn’t get himself out of the way, and I tripped on him. Fortunately, I didn’t fall, but I did stumble. And as I stumbled, just out of the corner of my eye, I could see the judge’s clipboard rise up. That meant she was writing on it. And the only reason for the judge to write on her clipboard is to take off points. 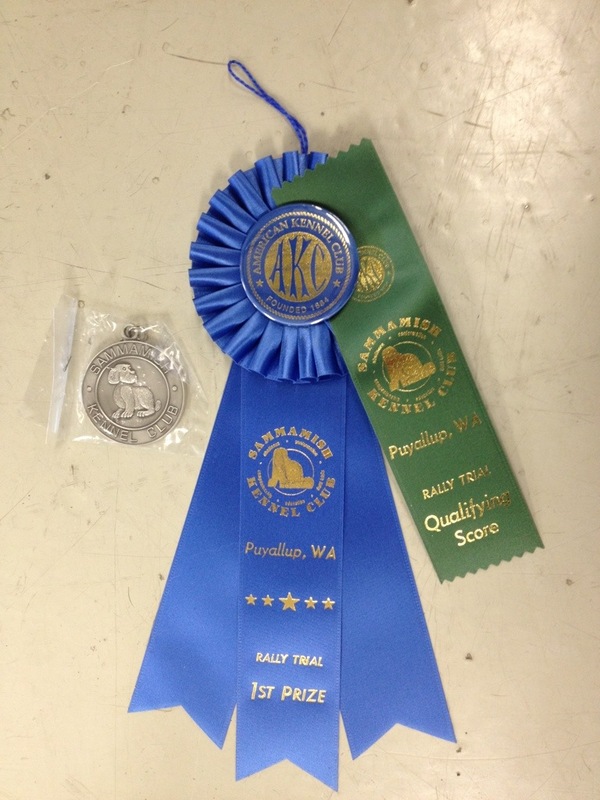 But even so, we got a very nice 94 and a 4th place ribbon. I was happily, delightedly ecstatic. And I’m sure the feeling will last for quite a while. Good boy Cooper! On Friday, I said I’d be happy if Cooper and I qualified in one (out of three) Rally Advanced B trials this weekend. Cooper qualified yesterday, so I went into today’s trial feeling happy. If we qualified twice, I said I’d be delighted. And tonight, I am not only delighted, I am really, r-e-a-l-l-y delighted. 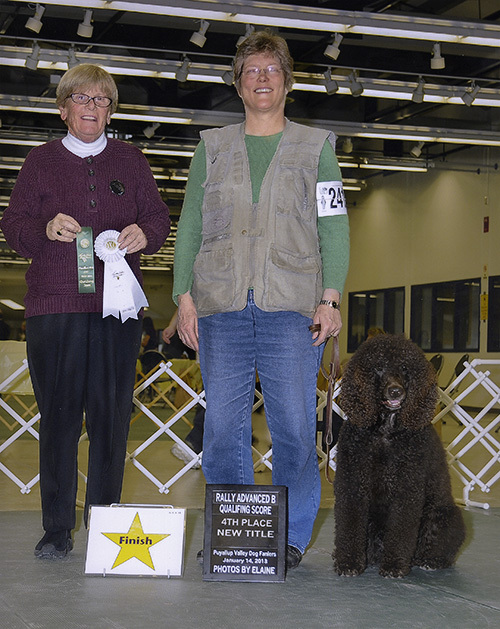 In today’s trial, Irish Water Spaniel #2418 got 99 out of 100 points. And that 99 put Team Cooper in 1st place. I am not only delighted, I am amazed at how well it all went. 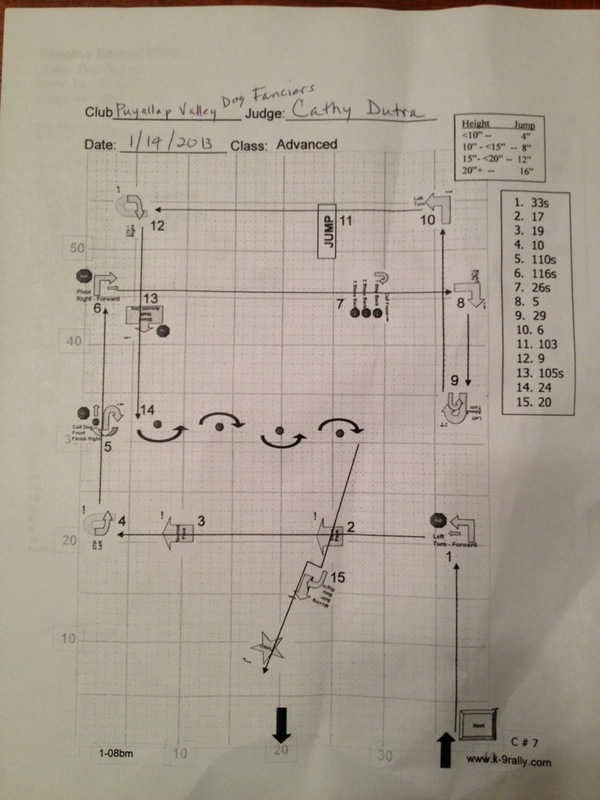 The judge took only one point off for Cooper’s being slightly out of position on a Pivot Right Forward. One of my fellow exhibitors commented to me that our run looked very smooth and easy. And you know, it felt smooth. Cooper’s brain stayed with me, his body mostly stayed in heel position, he got to do some fun things like leap over the bar jump, and I didn’t lose our place with all the curves and turns we had. It was fun, we both enjoyed ourselves, and I think it showed. That’s what I said as I left home last night for the Puyallup dog shows. 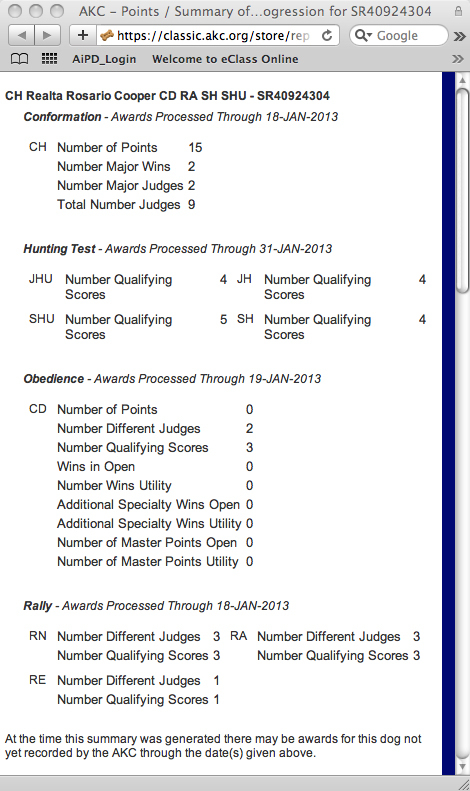 If Cooper and I got one qualifying score in Rally Advanced, I’d be happy. If we got two, I’d be delighted. And if we got three, I’d be ecstatic. As it stands now, I’m happy. In today’s Rally Advanced run, we got a score of 91 out of 100. Qualifying is 70 points, so 91 is quite respectable, right in the middle of the pack. The run started out well. There was a jump (exercise 103) early on, and Cooper likes those. Then there was a Fast Pace exercise (exercise 18), which Coop also likes because it involves running. But then we came to the serpentine. Coop is usually good at the serpentine. In class, anyway. But actual competition, well… that’s different. Outside that edge of the ring, there were people sitting and chatting. Several of these people, this being a dog show, had dogs with them. Right in the middle of the run, Cooper decided that he wanted to go have a closer look at one of these dogs, so he left my side and walked over to the edge of the ring. He forgot that we were working. He completely spaced out that I was there. The synapses between his ears and his brain temporarily shut down, and he obviously didn’t hear me calling him back to heel. That got his attention. His head whipped around before he had a chance to think about it, and his body followed his head right back to my side. We went back and started the serpentine again, which is allowed in Rally for a 3 point deduction. Much better than failing for performing the station improperly. The rest of the run was uneventful. * Except that at the end I has to restart my breathing. 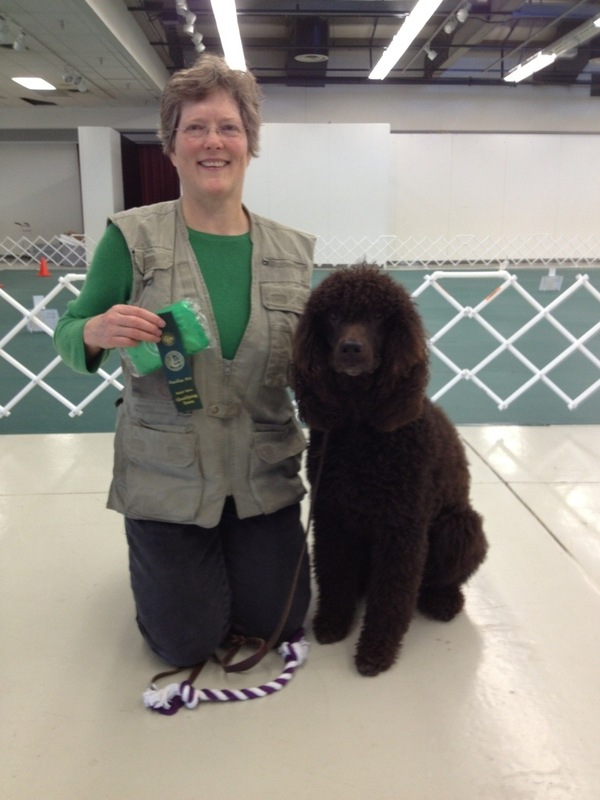 And we got the green ribbon for qualifying, along with a tug toy and a first aid kit from the Irish Water Spaniel Club of Puget Sound for competing and qualifying, respectively. So I’m happy today. We’ll see if tomorrow brings delighted. *Those of you who like to read Rally course maps will notice that station 14 isn’t correct. If we’d followed those directions, we’d end up facing away from the Finish sign instead of toward it. Fortunately, the steward noticed the problem before any exhibitors came into the ring and called it to the judge’s attention. 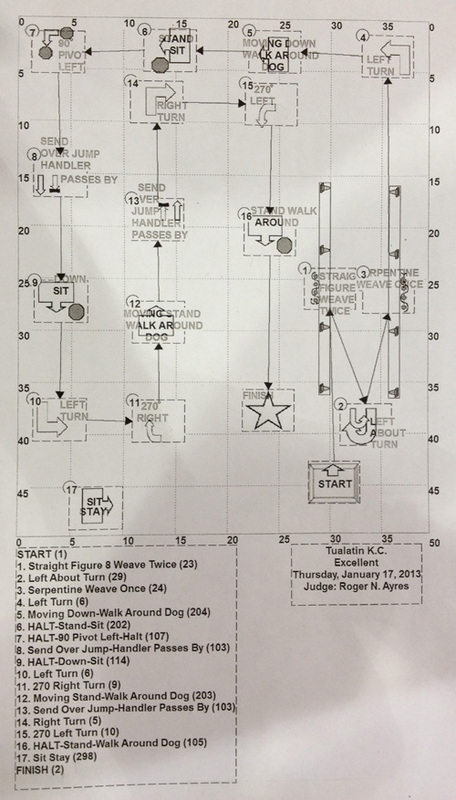 The judge then changed station 14 to a Call Dog Front — Finish Left — Halt (exercise 16).